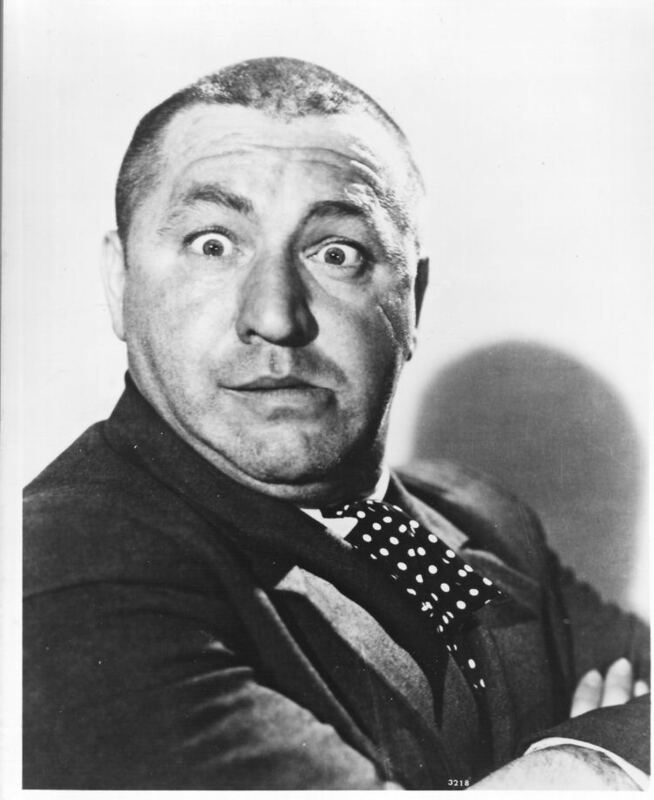 Born October 22, 1903 (1903-10-22) Bensonhurst, Brooklyn,New York, U.S.
Jerome Lester Horwitz (October 22, 1903 – January 18, 1952), better known by his stage name Curly Howard, was an American comedian and vaudevillian actor. He was best known as a member of the American farce comedy team the Three Stooges, which also featured his older brothers Moe and Shemp Howard and actor Larry Fine. Curly was generally considered the most popular and recognizable of the Stooges. He was well known for his high-pitched voice and vocal expressions ("nyuk-nyuk-nyuk! ", "woob-woob-woob! ", "soitenly!" (certainly), and barking like a dog) as well as his physical comedy (e.g., falling on ground and pivoting on his shoulder as he "walked" in circular motion), improvisations, and athleticism. An untrained actor, Curly borrowed (and significantly exaggerated) the "woob woob" from "nervous" and soft-spoken comedian Hugh Herbert. Curly's unique version of "woob-woob-woob" was firmly established by the time of the Stooges' second Columbia film, Punch Drunks (1934). 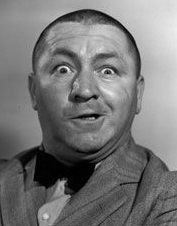 Curly was forced to leave the Three Stooges act in 1946 when a massive stroke ended his showbusiness career. He suffered through serious health problems and several more strokes until his death in 1952 at age 48. 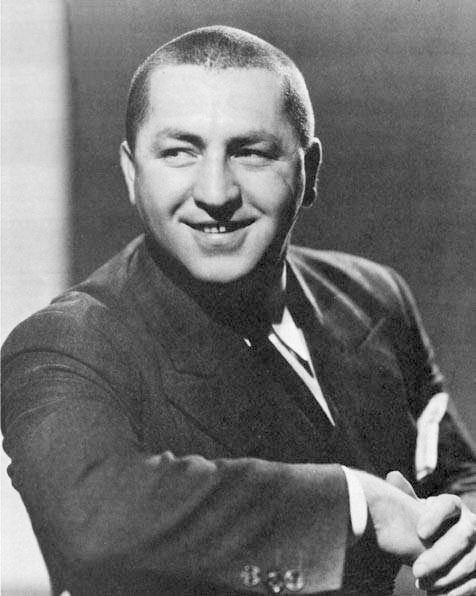 Curly Howard was born Jerome Lester Horwitz in the Bensonhurst section of the Brooklyn borough of New York City, on October 22, 1903. Of Lithuanian Jewish ancestry, he was the youngest of the five sons of Jennie (Gorovitz) and Solomon Horwitz. Because he was the youngest, his brothers called him "Babe" to tease him. The name "Babe" stuck with him all his life, although when his older brother Shemp Howard married Gertrude Frank, who was also nicknamed "Babe," the brothers called him "Curly" to avoid confusion. His full formal Hebrew name was "Yehudah Lev ben Shlomo Natan ha Levi." A quiet child, Curly rarely caused problems for his parents (something older brothers Moe and Shemp excelled in). He was a mediocre student but excelled as an athlete on the school basketball team. He didn't graduate from high school, and instead he kept himself busy with odd jobs and constantly following his older brothers, whom he idolized. He was also an accomplished ballroom dancer and singer and regularly turned up at the Triangle Ballroom in Brooklyn, occasionally bumping into George Raft. When Curly was 12, he accidentally shot himself in the left ankle while cleaning a rifle. Moe rushed him to the hospital and saved his life. The wound resulted in a noticeably thinner left leg and a slight limp. He was so frightened of surgery that he never had the limp corrected. While with the Stooges, he developed his famous exaggerated walk to mask the limp on screen. Curly was interested in music and comedy and would watch his brothers Shemp and Moe perform as stooges in Ted Healy's vaudeville act. He also liked to hang around backstage, although he never participated in any of the routines. From an early age, Curly was always "in demand socially," as brother Moe put it. He married his first wife, Julia Rosenthal, on August 5, 1930, but the couple had their marriage annulled shortly afterwards. Curly's first on-stage break was as a comedy musical conductor in 1928 for the Orville Knapp Band. Moe later recalled that his performances usually overshadowed those of the band. Though Curly enjoyed the gig, he watched as older brothers Moe and Shemp (and partner Larry Fine) made it big as some of Ted Healy's "Stooges." Vaudeville star Healy had a very popular stage act, in which he would try to tell jokes or sing, only to have his stooges wander on stage and interrupt or heckle him and cause disturbances from the audience. Meanwhile, Healy and company appeared in their first feature film, Rube Goldberg's Soup to Nuts (1930). Shemp, however, disliked Healy's abrasiveness, bad temper, and heavy drinking. In 1932, he was offered a contract at the Vitaphone Studios in Brooklyn. (Contrary to stories told by Moe, the role of "Knobby Walsh" in the Joe Palooka series did not come along until late 1935, after Shemp had been at Vitaphone for three years and had already appeared in almost thirty short subjects.) Shemp was thrilled to be away from Healy but, as was his nature, worried incessantly about brother Moe and partner Larry. Moe, however, told Shemp to pursue this opportunity. With Shemp gone, Moe suggested that Curly fill the role of the third Stooge. But Healy felt that Curly, with his thick, chestnut hair and elegant waxed mustache, did not "look funny" and was "too handsome". Curly left the room and returned minutes later with his head shaven (the mustache remained very briefly). Healy quipped, "Boy, don't you look girlie?" Moe misheard the joke as "curly," and all who witnessed the exchange realized that the nickname "Curly" would be a perfect fit. In one of the few interviews Curly gave in his lifetime, he complained about the loss of his hair: "I had to shave it off right down to the skin." In 1934, MGM was building Healy up as a solo comedian in feature films and Healy dissolved the act to pursue his own career. Like Shemp, the team of Howard, Fine, and Howard was tired of Healy's alcoholism and abrasiveness and renamed their act the "Three Stooges." That same year, they signed on to appear in two-reel comedy short subjects for Columbia Pictures. The Stooges soon became the most popular short-subject attraction, with Curly playing an integral part in the trio's work. Curly's childlike mannerisms and natural comedic charm made him a hit with audiences, particularly children. He was known in the act for having an "indestructible" head, which always won out by breaking anything that assaulted it, including saws (resulting in his characteristic quip, "Oh, look!"). Although having no formal acting training, his comedic skills were exceptional. Many times, directors would simply let the camera roll freely and let Curly improvise. Jules White, in particular, would leave gaps in the Stooge scripts where Curly could improvise for several minutes. In later years, White commented: "If we wrote a scene and needed a little something extra, I'd say to Curly, 'Look, we've got a gap to fill this in with a "woob-woob" or some other bit of business.' And he never disappointed us." "Say a few syllables" - to another (injured) stooge, usually Moe. By 1944, Curly's energy began to wane. Films like Idle Roomers (1944) and Booby Dupes (1945) present a Curly whose voice was deeper and his actions slower. It is believed that he suffered the first of many strokes between the filming of Idiots Deluxe (October 1944) and If a Body Meets a Body (March 1945). After the filming of the feature length Rockin' in the Rockies (December 1944), he finally checked himself (at Moe's insistence) into Cottage Hospital in Santa Barbara, California, on January 23, 1945, and was diagnosed with extreme hypertension, a retinal hemorrhage, and obesity. His ill health forced him to rest, leading to only five shorts being released in 1945 (the normal output was six to eight per year). The Three Stooges: An Illustrated History, From Amalgamated Morons to American Icons by Michael Fleming, unfortunately invented an untrue tale about Moe pleading with Harry Cohn to allow his younger brother some time off upon discharge to regain his strength, but Cohn would not halt the production of his profitable Stooge shorts and flatly refused his request (one of the worst criticisms leveled at Cohn in his last years). Author Michael Fleming: "it was a disastrous course of action." In truth, the Stooges had five months off between August 1945 and January 1946. They used that time to book themselves a feature film at Monogram, and then leave on a 2-month live performance commitment in New York City working shows 7 days per week. During that grueling NYC appearance, Curly met and married his 3rd wife Marion Buxbaum, a bad relationship that further deteriorated Curly's health and morale. Returning to L.A. in late November 1945, Curly was a shell of his former self. With two months rest, the team's 1946 schedule at Columbia commenced in late January, but involved only 24 days work during February - early May. In spite of 8 weeks' time off in that same period, Curly's condition continued to deteriorate. 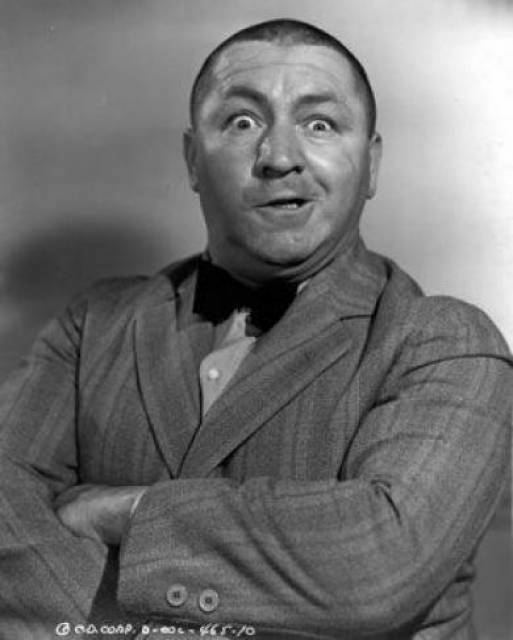 By early 1946, Curly's voice had become even more coarse than before, and it was increasingly difficult for him to remember even the simplest dialogue. He had lost a considerable amount of weight, and lines had creased his face. Half-Wits Holiday (released 1947) would be Curly's final appearance as an official member of the Stooges. During filming on May 6, 1946, Curly suffered a severe stroke while sitting in director Jules White's chair, waiting to film the last scene of the day. When Curly was called by the assistant director to take the stage, he did not answer. Moe went looking for his brother: he found Curly with his head dropped to his chest. Moe later recalled that his mouth was distorted and he was unable to speak, only cry. Moe quietly alerted White to all this, leading the latter to rework the scene quickly, dividing the action between Moe and Larry while Curly was rushed to the hospital, where Moe joined him after the filming. Curly spent several weeks at the Motion Picture and Television Country House and Hospital in Woodland Hills, California before returning home for further recuperation. In January 1945, Shemp had been recruited to substitute for a resting Curly during live performances in New Orleans. After Curly's stroke, Shemp agreed to replace him in the Columbia shorts, but only until his younger brother was well enough to rejoin the act. An extant copy of the Stooges' 1947 Columbia Pictures contract was signed by all four Stooges and stipulated that Shemp's joining "in place and stead of Jerry Howard" would be only temporary until Curly recovered sufficiently to return to work full time. Curly filmed a second cameo as an irate chef two years later for the short Malice in the Palace (1949), but due to his illness, his performance was not deemed good enough and his scenes were cut. A lobby card for the short shows him with the other Stooges, although he never appeared in the final release. Still not fully recovered from his stroke, Curly met Valerie Newman and married her on July 31, 1947. A friend, Irma Leveton, later recalled, "Valerie was the only decent thing that happened to Curly and the only one that really cared about him." Although his health continued to decline after the marriage, Valerie gave birth to a daughter, Janie, in 1948. Later that year Curly suffered a second massive stroke, which left him partially paralyzed. He used a wheelchair by 1950 and was fed boiled rice and apples as part of his diet to reduce his weight (and blood pressure). Valerie admitted him into the Motion Picture Country House and Hospital on August 29, 1950. He was released after several months of treatment and medical tests, although he would return periodically until his death. In February 1951, he was placed in a nursing home, where he suffered another stroke a month later. In April, he went to live at the North Hollywood Hospital and Sanitarium. In December 1951, the North Hollywood Hospital and Sanitarium supervisor advised the Howard family that Curly was becoming a problem to the nursing staff at the facility because of his mental deterioration. They admitted they could no longer care for him and suggested he be placed in a mental hospital. Moe refused and relocated him to the Baldy View Sanitarium in San Gabriel, California. On January 7, 1952, Moe was contacted on the Columbia set while filming He Cooked His Goose to help move Curly for what would be the last time. Eleven days later, on January 18, Curly died. Curly lived the shortest life of the Stooges, dying at the age of 48. He was given a Jewish funeral and laid to rest at the Western Jewish Institute section of Home of Peace Cemetery in East Los Angeles. Curly's older brothers, Benjamin and Shemp, and parents Jennie and Solomon are all interred there as well. 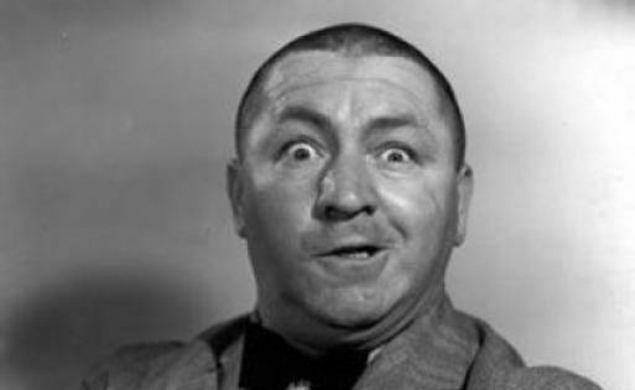 Curly's offscreen personality was the antithesis of his onscreen manic persona. An introvert, he generally kept to himself, rarely socializing with people unless he had been drinking (which he would increasingly turn to as the stresses of his career grew). In addition, he came to life when in the presence of brother Shemp. Curly could not be himself around brother Moe, who treated his younger brother with a fatherly wag of the finger. Never an intellectual, Curly simply refrained from engaging in "crazy antics" unless he was in his element: with family, performing or intoxicated. On June 7, 1937, Curly married Elaine Ackerman, who gave birth to their only child, Marilyn, the following year. The couple divorced in June 1940, after which he gained a lot of weight and developed hypertension. He was also insecure about his shaved head, believing it made him unappealing to women; he increasingly drank to excess and caroused to cope with his feelings of inferiority. He took to wearing a hat in public to convey an image of masculinity, saying he felt like a little kid with his hair shaved off, even though he was popular with women all his life. In fact, many who knew him said women were his main weakness. Moe's son-in-law Norman Maurer even went so far as to say he "was a pushover for women. If a pretty girl went up to him and gave him a spiel, Curly would marry them. Then she would take his money and run off. It was the same when a real estate agent would come up and say 'I have a house for you'; Curly would sell his current home and buy another one." During World War II, for seven months of each year, the trio's filming schedule would go on hiatus, allowing them to make personal appearances. The Stooges entertained servicemen constantly, and the intense work schedule took its toll on Curly. He never drank while performing in film or on stage; Moe would not allow it. But once away from Moe's watchful eye, he would find the nearest nightclub, down a few drinks, and enjoy himself. His drinking, eating, and carousing increased. He had difficulties managing his finances, often spending his money on wine, food, women, homes, cars, and especially dogs, and was often near bankruptcy. Moe eventually helped him manage his money and even filled out his income tax returns. On July 31, 1947, he married Valerie Newman. They had one daughter together, named Janie (born in 1948), and remained married until his death. 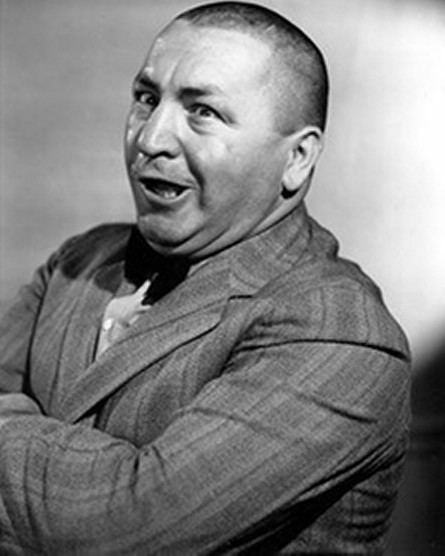 Curly Howard is considered by many fans and critics alike to be their favorite member of The Three Stooges. In a 1972 interview Larry Fine recalled, "Personally, I thought Curly was the greatest because he was a natural comedian who had no formal training. Whatever he did, he made up on the spur of the moment. When we lost Curly, we took a hit." Curly's mannerisms, behavior and personality along with his catchphrases of "n'yuk, n'yuk, n'yuk," "woob, woob, woob" and "soitenly!" have become a part of American popular culture. Steve Allen called him one of the "most original, yet seldom recognized, comic geniuses." From 1980 to 1982, the ABC TV comedic skit series, Fridays, featured an occasional skit of "The Numb Boys" - essentially a Three Stooges routine related to a recent news topic - with John Roarke playing a very convincing Curly (and Bruce Mahler as Moe and Larry David as Larry). In 2000, longtime Stooges fan Mel Gibson produced a television film for ABC about the life and careers of the Stooges. 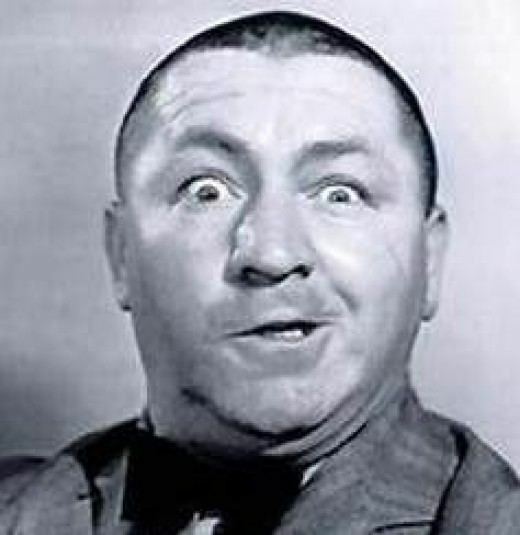 In an interview promoting the film, he said Curly was his favorite of the Stooges. In the film, Curly was played by Michael Chiklis. In the 2012 Farrelly brothers' film The Three Stooges, Will Sasso portrays Curly. Robert Capron portrays Young Curly. In the 2017 film Captain Underpants, the elementary school that served as the setting of the film was named Jerome Horwitz Elementary School (real name of Curly Howard).